Today, for the first time in our history, over 50,000 students have subscribed to the SAP HANA Academy. To celebrate this milestone, let me share with you a brief history, some highlights, and the top 5 of the Billboard Hot 100. In August 2012, a couple of months after the first general availability (GA) release of SAP’s brand new in-memory platform (High Performance Analytics Appliance to some, Hasso’s New Architecture to others), we started to publish our first hands-on tutorial videos about SAP HANA on the SAP Technology YouTube channel. At the time, this was a radical concept, giving away training content, all for free. Nuts! Below, one of the very first videos where we can hear Alexis Guinebertiere introducing the Explorer project and with Bob showing how you can use the command line utility to run a SQL query. This still works as-is on the latest SAP HANA release. No wonder this video has now been watched almost 20,000 times! Thanks guys. Together with the Academy videos on the Technology channel, the tutorials have had close to 8 million views. Below our Top 5 for 2018. Overviews tutorials and S/4HANA videos were high in demand. The most viewed video by a large margin is, no surprise, the Welcome to the SAP HANA Academy video. Version number 1 has been viewed 303K times. The original video is no longer available, the link is to the latest version. The Welcome is on autoplay, so, fair enough, we would be cheating a bit to include it on our BWE list. Below our Top 5 best watched ever. Do you remember? 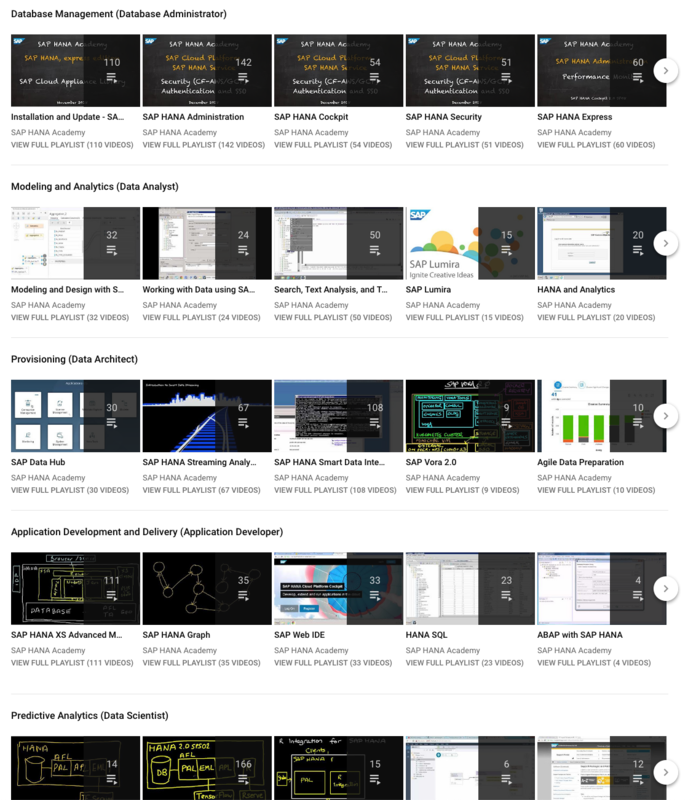 Since the SAP HANA 1.0 SPS 05 release (introducing XS and SAPUI5), we have created the video tutorials to accompany all the new SAP HANA releases and we will be continuing to do so. Additionally, there are multiple playlists with end-to-end business scenarios, Building Solutions, where we teach you how to create fully functional apps starting from scratch covering different tools and technologies. More recently, you can also find a lot of brand new video tutorial content about the SAP Cloud Platform, S/4HANA and B/4HANA. Congrats Denys van Kempen! It’s a great achievement. I remember my first days with HANA (SP9 was about to be released) and SAP HANA Academy was a great source of knowledge! I wish the entire team all the best in 2019! Thanks Denys for the wonderful contents in the HANA academy channel. I have benefited immensely from the tutorials and I am sure many others have as well. It’s a treasure trove!! Good to hear the Academy has been useful to you. Congratulations Denys..!! All the SDA knowledge I have gained from your videos. I will pass it to our whole team. Keep on truckin’!